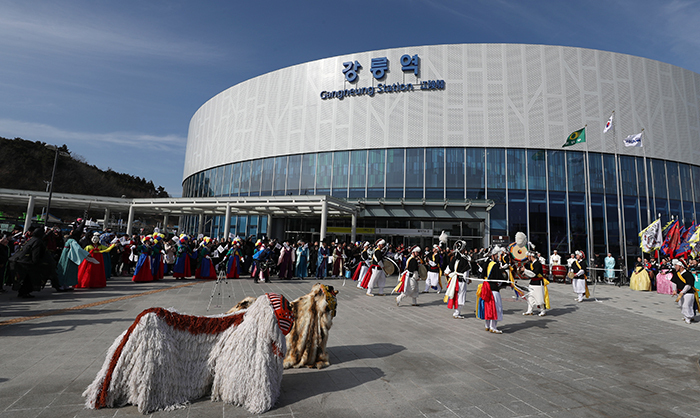 With more than 20,000 daily users, Gangneung Station has become the gateway to the PyeongChang 2018 Olympic Winter Games and a new attraction for tourists. The photo shows a traditional march and percussion performance in front of the station on Feb. 15. Gangneung Station is the end of the high-speed KTX Gyeonggang Line that opened in December before the PyeongChang 2018 Olympic Winter Games. The station has recently become a popular site for overseas tourists who are visiting Korea for the Olympic Games. The station is considered the gateway to Gangneung, the city where all Olympic skating events are being held, and also a well-known tourist attraction in its own right. Since its opening, more than 20,000 people use the station every day. On the Olympic opening day alone, Feb. 9, a total of 28,400 people traveled through the station. President Moon Jae-in and other heads of state have also used Gangneung Station. “We’ve been providing 24-hour on-the-spot service for non-Korean tourists who have been traveling through our station,” he said. .
Berky Bruso (second from left) and her family pose for a photo at the Olympic symbol and Bandabi, the mascot for 2018 Paralympic Winter Games, in front of Gangneung Station on Feb. 15. Bruso said her family enjoyed watching the cultural events here and that they would love to have more opportunities to learn about Korean heritage and traditions. Her youngest daughter is wearing a Soohorang backpack. Gangneung Station is also considered to be the final photo spot for Olympic memories for international tourists who have to leave Korea after finishing their Olympic journey. 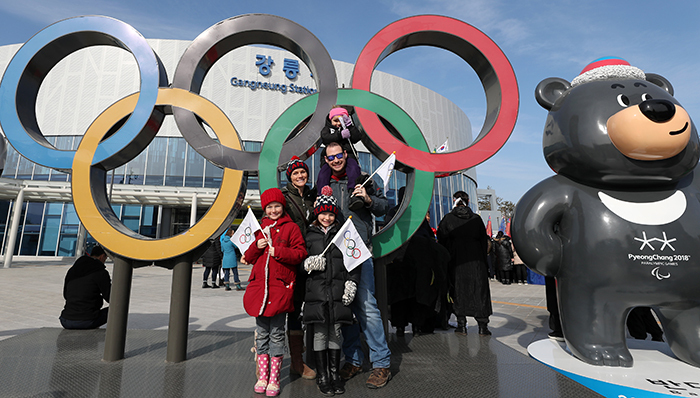 Many travelers willingly queue up just to take a photo with the statues of the Olympic symbol, accompanied by Soohorang and Bandabi, the official mascots of the 2018 Olympic and Paralympic Winter Games, that stand in front of the main gate of the station. Tyler Deher, a volunteer worker from the U.S., also helps tourists to take photos with the statues, while helping out the non-Korean sightseers with general inquiries. Deher said he’s ready to help international visitors during the Games, while mentioning the various cultural events that are scheduled to take place at Gangneung Station every day. The square in front of Gangneung Station has become the latest spot to make an Olympic memory for many tourists. 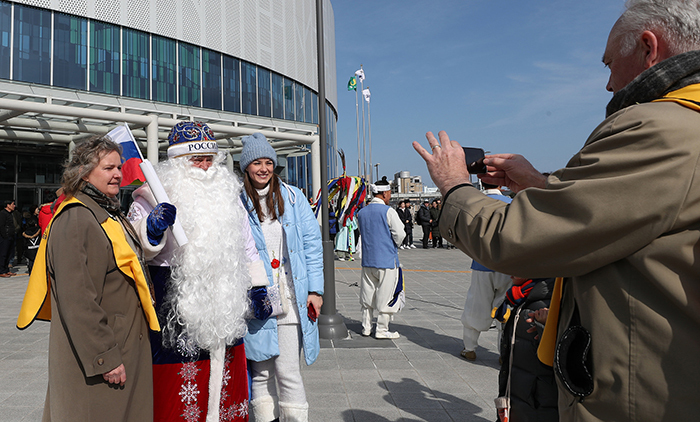 Volunteer worker Sister Nilson (left) poses for a photo with Des Moroz from Russia wearing a Father Winter costume, in front of the station on Feb. 15.